International Co-operation Minister Bev Oda tells Parliament she was the person who directed that a recommendation from her staff be altered to deny funding to a church-backed aid group. 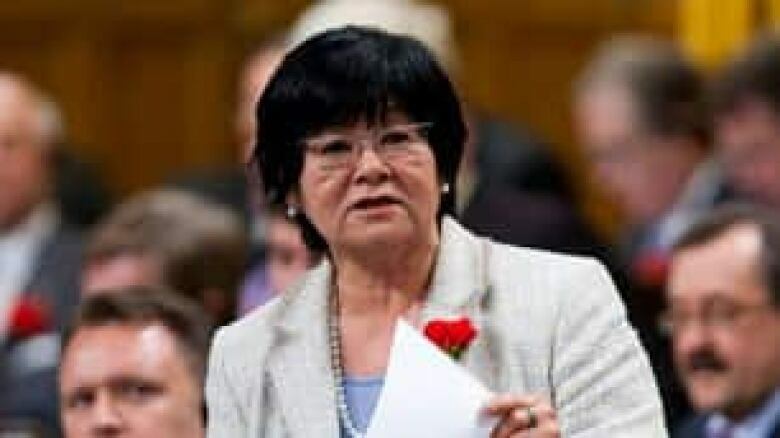 International Co-operation Minister Bev Oda told Parliament Monday that she was the person who directed that a recommendation from her staff be altered to deny funding to a church-backed aid group. The minister was backtracking on previous statements in which she said Kairos had lost its funding because the group's work no longer fit with the Canadian International Development Agency's objectives — suggesting she was acting on her department's recommendation. International Co-operation Minister Bev Oda denies misleading the House. The agency had recommended that Kairos should get $7 million, and the fact the document was "doctored" — a "not" was inserted to change its meaning — drew a strong rebuke from Speaker Peter Milliken. Oda's reversal came just before the House foreign affairs committee voted to find the matter a point of privilege. It is writing a report on Oda's earlier testimony, will discuss it Wednesday and then send to the House. "I wish to clearly inform the House of the matter and clear up any misunderstanding that exists," Oda said Monday. "… The 'not' was inserted at my direction. Are you satisfied with Bev Oda's apology? "… The CIDA officials did forward a document in which they sought approval of the recommendation for funding of the Kairos proposal. But ultimately the decision to provide funding was mine — or, to not provide funding — was mine as minister of international co-operation," she said. "I was fully aware that my decision was not aligned with the recommendation of the department." Oda noted that the Opposition has asked the Speaker to rule on whether she intentionally or knowingly misled the House. "At no time have I stated that the decision for funding was that of the department," she said. "I have repeatedly and clearly stated in response to questions in the House and at a committee, that the funding decision was mine." Read the CBC's original report on the 'doctored' documents. Kairos describes itself as a "faith-based ecumenical organization" that pursues social and economic justice projects with local partners in Africa, Asia, Latin America and the Middle East. Its members include the Anglican Church of Canada, the Evangelical Lutheran Church in Canada, the Presbyterian Church in Canada, the United Church of Canada, the Quakers, the Mennonite Central Committee of Canada and several Roman Catholic bodies including the Canadian Conference of Catholic Bishops. Liberal foreign affairs critic Bob Rae said the minister was contradicting her earlier remarks. "I think it is akin to fraud," he said. "The government has misled us, misled Canadians … because they kept on saying, this is a decision of CIDA, [it] didn't fit into their priorities." 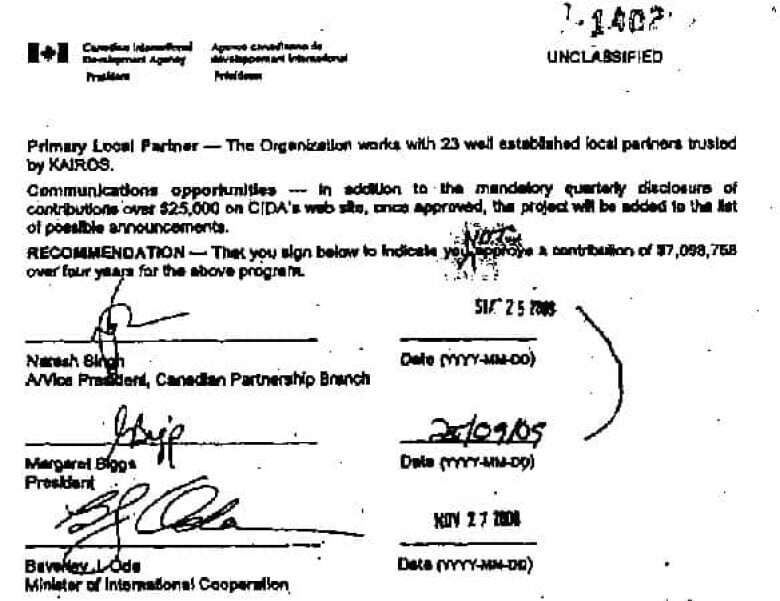 Rae said the senior officials at CIDA wanted the funding to go to Kairos, and a "not" appears over some people's names, "which is frankly a fabrication, it's a fabrication of their position." On Monday in the Commons, Oda sounded a note of remorse over the whole matter. "I would, Mr. Speaker, indicate to you that the way in which this case has been handled, including by myself, has been unfortunate. In no way have I intentionally or knowingly misled the House or the committee," she said. Calgary East Conservative MP Deepak Obhrai, who is a member of the foreign affairs committee, said Oda had straightened out her statement Monday. "[The] most important thing is the way it was handled, which she admitted was not … well — but she apologized." An earlier version of this story said International Co-operation Minister Bev Oda's reversal came after the House foreign affairs committee voted to find the matter a point of privilege. In fact, the statement was made just before the committee vote.